British Airways announces Direct Entry recruitment roadshows! Prepare your British Airways assessment with us! 3-day intensive seminar training, during which all elements of the Uk PilApt-Test are mapped. The performance is increased for the capacity requirements on the basis of an individual training schedule, which is created in accordance with a detailed performance record at the start of the seminar. In addition to the in-depth instruction in the exercises for the capacity procedures of the CompassTest by staff of the SkyTest® software manufacturer, the trainers also provide tried-and-tested and targeted strategies to improve the personal performance balance. "...Flight Capacity Test addresses various pilot aptitudes from information perception and processing to divided - visual and aural - attention, short term memory, multi-tasking and stress tolerance. The task plots a flight deck situation with ATC instructions to apply and aircraft systems to handle, while remaining attentive to the live traffic environment around you.Primary task is NAVIGATION and conflict awareness. ATC will announce navigation instructions like waypoint, altitude and radio frequency updates to apply. Along with this, you have to recognize and highlight evolving traffic conflicts on a TCAS screen. Two secondary tasks call attention to aircraft systems. 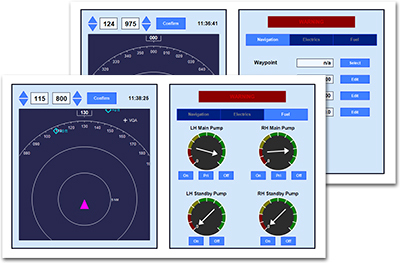 You have apply updated settings to aircraft ELECTRICS and resolve FUEL pump failures..."
SoftwarePackage for pretraining will be made available immediately after receiving the fees.